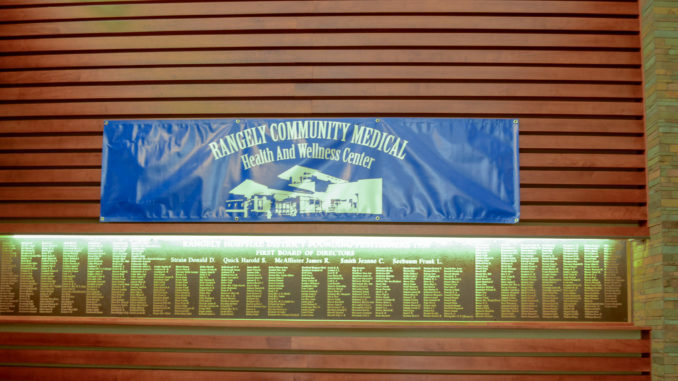 RANGELY | Rangely District Hospital had an open house June 21 to announce the new name of the campus, Rangely Community Medical Health and Wellness Center. At the beginning of the open house, Chief Executive Officer Nick Goshe gave a speech informing the public that rural health care is dying. Since 2010, 83 rural hospitals have closed their doors. He believes communities needs strong healthcare. The hospital has spent millions on regulations since 2010 including the most expensive of these: government-mandated electronic medical records. When these regulations are passed, the cost to small communities is not taken into account. Medicare is the hospital’s largest payer. Medicare tells the hospital what to do with the implication they won’t pay if these changes are not completed. Healthcare is the third most-regulated industry behind nuclear power plants and chemical waste facilities. The amount that is spent on healthcare regulations is unfathomable. Goshe also spoke about the new sign recently placed out front to inform the community of upcoming events. This will help people know what’s happening at the hospital campus, like upcoming blood drives. The sign also shows the community the campus’s new name. “This hospital since its inception has grown,” Goshe said. The campus now offers many services that are not part of a hospital in typical towns such as physical therapy, pharmacy, clinic, lab and radiology. The hospital portion is still titled Rangely District Hospital but the campus itself is now known as Rangely Community Medical Health and Wellness Center. Many of the people in the community and the surrounding areas are uninformed of the services offered. The sign is an effort to increase awareness of those services. The hospital has worked hard these last few years to keep the campus up and running with budget cuts, no raises for three straight years and reducing costs where possible. The fiber-optic internet service has led to a less expensive medical records system. Instead of paying upwards of $1 million a year, they are paying about $400,000. Goshe says they have done everything they can do. They haven’t replaced people who have left, including a physician. The next thing will be to cut jobs and services. Under current conditions, they do not bring in enough revenue to pay for the services they offer. Healthcare is integral to any community. You have to have a good healthcare system to recruit workers across a wide variety of professions. John Payne, hospital board president, introduced the video that was created in-house to emphasize all the services the campus offers. He stated the board members are committed to keeping the hospital viable for the years to come and enjoys when people tell him the great experiences they have had with this center. If you would like to see “Un-Havoc-able!” visit https://youtu.be/qbhdPirqXzE. Having Rangely Community Medical Health and Wellness Center, with all the various services it provides, is another attraction for potential employees or students coming to Rangely. RANGELY — Alaska’s loss is Rangely’s gain with the addition of Dr. Brenda Hinton as a full-time Rangely District Hospital staff physician. RANGELY | Rangely District Hospital will offer a “Mental Health First Aid” course Jan. 15-16 in Rangely. The course runs Wednesday and Thursday from 12:30 p.m. to 4:30 p.m. for an eight-hour training certification. RBC — The eastern and western Rio Blanco Metropolitan Recreation and Park Districts and the Rangely District Hospital elected new board members during the May 6 special district elections.